One of the great pleasures after a long day of paddling, portaging and getting all the camp chores done is to string a hammock from a pair of trees close to the water’s edge, grab a book and perhaps a glass of wine, and relax for a while. We were doing just that one day at our beach camp on Lake Alice and thinking it couldn’t get any better, when it absolutely did. another dove in to steal it away. Trying to defend its prey, the eagle headed back to shore with its catch, and, just as it was about to make landfall, two more eagles appeared to claim its prize. An aerial wrestling match ensued before all four eagles finally landed just around the bend from our camp. “Grab your camera and get in the canoe!” Matt yelled as we nearly fell out of our hammocks from excitement. By the time we got to our subjects, one of the eagles was perched in a tree, while the three others were devouring the fish just out of sight on land. As we approached, one of the eagles took off only to be dive bombed by the eagle in the tree. A third eagle took flight right over our canoe, and seeing its massive 8-foot wingspan from just a few feet below left us sitting slack-jawed in pure awe. We were able to track one of the eagles to its landing spot in a tree just across the bay from our camp, and, by the time we paddled over to it, the clouds parted just enough to allow the gorgeous late afternoon light to illuminate the bird. The only thing that could have made the experience better is if we could have taken these photos from our hammocks. 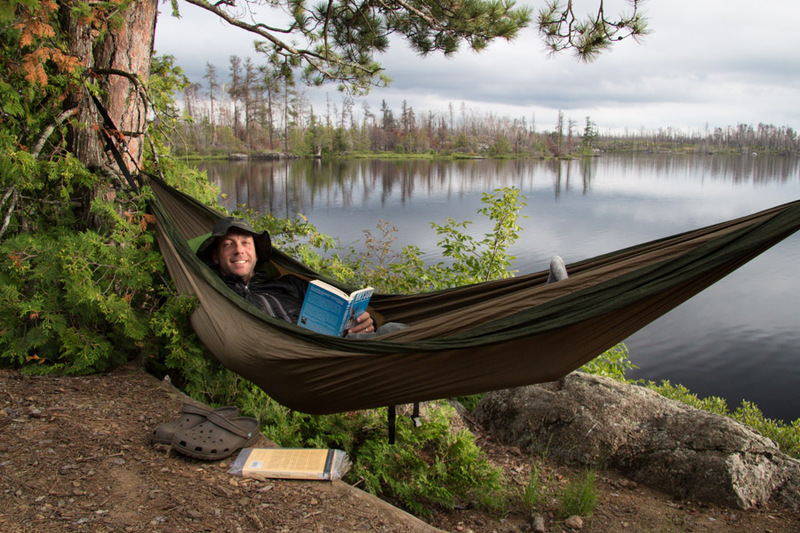 Life in the Boundary Waters can be pretty rough, eh? I enjoy reading your adventures. Good to hear from you, Adrian! It sounds like you are on a pretty cool adventure of your own. Thanks for reading! 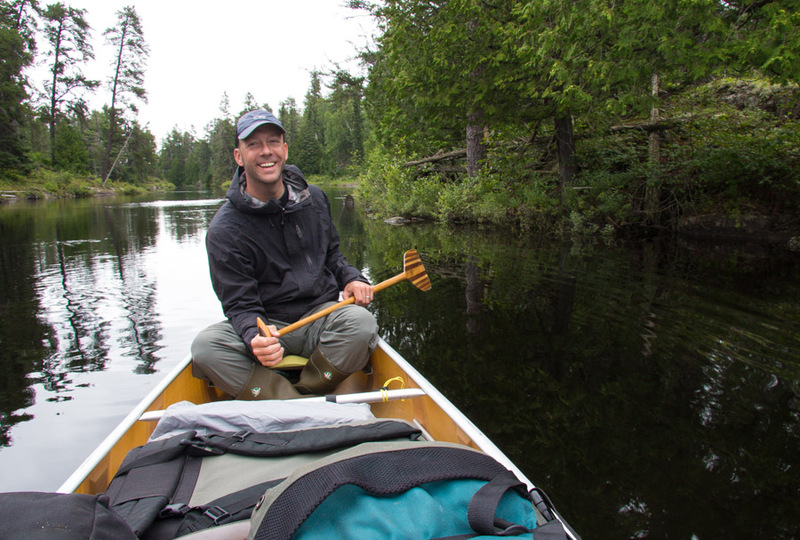 Behind every great photograph, there is usually a very patient friend or master paddler! You are so right about that, Daryl. It’s a good thing that we share so many of the same interests! Thanks, Melissa! Matt says he would be happy to paddle you around Lake Atitlán in support of your photography, too! Thanks for visiting our blog, Russel. I bet those eagles were quite the attraction. I wonder how they knew to pick that tree? No dummies, indeed! You guys sound like our kinda people! Very cool! We have some unused space in our house, and Matt keeps saying that he wants to hang our hammocks up there during the winter. When we need a break, we could go there to chill out, listen to loon calls and pretend we are in the north woods. Right about now that sounds like a great idea! I enjoyed looking through your photos on your blog, and it’s too bad we don’t live closer (though I’m not actually sure where you live). We do seem to be cut from the same cloth. Cheers!